Eric Lloyd Murdock was born June 14, 1968 in Somerville. Eric grew up in Bridgewater Township, where he was a standout in youth-league basketball, but also in baseball and football. A quick and clever ballhandler, Eric was the star of the Bridgewater–Raritan High basketball team. He was a high-intensity defender with a superb offensive game. He had the ability to overwhelm opponents at both ends of the court. Eric also played on the Cougars’ baseball and football teams. Eric was recruited by several top schools as a senior. He wanted to stay in the area and ideally play for a Big East team. That wish came true when Gordon Chiesa offered him a scholarship to Providence in 1987. After a good freshman year, Eric stepped up his game as a sophomore and junior and led the Friars to the NCAA Tournament in 1989 and 1990. Eric exploded into the national spotlight as a senior, averaging 25.6 points a game and setting a Big East record with 435 points in games against conference opponents. He set another Big East record with 48 points in a game against Pitt—although the Friars lost. Eric also had 11 steals in 32 games in 1990–91 to finish his college career with 376—an NCAA record. Naturally, he was known as The Man of Steal. Eric was selected by the Utah Jazz with the 21st pick in the 1991 NBA Draft. He played one year as a backup to John Stockton before a trade to the Milwaukee Bucks landed him a starting job. 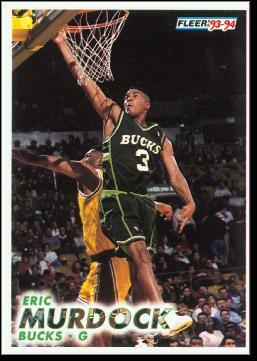 Eric had three solid seasons, averaging around 14 points, 7 assists and 2 steals a game. In 1995–96, the Bucks made Sherman Douglas their starting point guard and traded Eric to the Vancouver Grizzlies after nine games. Eric signed a free agent deal with the Denver Nuggets in 1996–97, but could not crack the starting rotation. The Nuggets released him after 12 games and he finished the 1996–97 season overseas, with TeamSystem Bologna of the Italian League, averaging just under 20 points a game in 26 contests. That performance earned him a shot with the Miami Heat in 1997–98 and Eric made the most of it. He was Tim Hardaway’s backup and played the role of supersub—appearing in all 82 games and finishing second on the team in steals and assists. The Heat finished atop the Atlantic division, but lost to the Knicks in a hotly contested first-round series. Now in his 30s, Eric played two more years—one with the Nets and one with the Clippers. Hoping to extend his career a bit more, played ball with teams in the CBA, ABA and Italian League before retiring from pro basketball in 2003 at the age of 35.